Daily PUMA: Is Barack Obama leading our country towards a civil uprising with his inability to make any progress regarding home foreclosures? Is Barack Obama leading our country towards a civil uprising with his inability to make any progress regarding home foreclosures? (Edit update Feb. 20, 2010) This article was found at Mountain Sage. Then, in the comments section, there was a response that provided a link to what Barack Obama is trying to do about the situation. This link to the president's proposal is eerily similar to what I am suggesting in my article below and although the president's press release actually was released a couple of hours before the article I have written below was first released, I never saw the link above until well after I had written my article below). A couple of weeks ago, a homeowner bulldozed his own home when the bank wanted to foreclose on it even though he may have had as much as 200,000 dollars of equity established in the home. The homeowner found someone to pay what was owed to the bank but the bank said no, they could make more money by foreclosing. If the bank foreclosed, the homeowner would probably lose his 200,000 dollars of equity. Yesterday, a frustrated american burned his own home and then crashed his small plane into an IRS office. In both instances, the government backed institutions seemed to be doing things by the book. Can I suggest that the government quickly change the book? This is what concerns me about Barack Obama. He roars like a lion and then backpedals in situations that are crucial to main street's survival. Barack promises on February 14, 2009 (Valentines day) to help curtail home foreclosures. Just a couple of months later, Barack Obama waffles on his Valentines Day 2009 promise. Which leads us to almost a YEAR LATER and 10,000 homes foreclosed on EACH AND EVERY DAY! 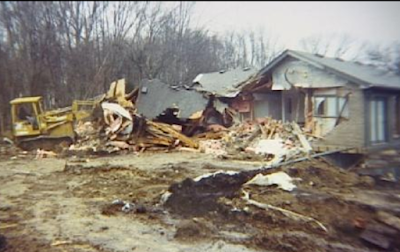 One american with as much as 200,000 dollars of home equity in his home BULLDOZED HIS OWN HOME BECAUSE THE BANK WAS JUST GOING TO FORECLOSE EVEN AFTER HE FOUND A PARTNER TO PAY WHAT WAS OWED! I can understand the difficulty of legislating to help homeowners who owe more than their home is worth, but to then allow banks to go after homeowners that have some equity built up in their home and just take the home is outrageous and goes to a disturbing pattern concerning Barack Obama's administration. Barack Obama seems to want to tackle entire problems head on, but then is not able to come up with anything that would at least begin to partially solve the problem, and americans are suffering as a result. This particular incident (of the bulldozed home) happened a short distance from my neighborhood. My understanding is that the homeowner owned a small business that is going under. The bank wanted to get it's $$$ for the business... so decided to take his home as well. Even though the homeowner claims that he had always made house payments and is not behind. As for the engineer that flew a plane into the IRS building.... I just don't know. I don't think insanity like that can be justified no matter what was happening to his home, life savings etc. BUT... again, I suspect the story will be about the failure of his small business through no fault of his own. He said, in his diatribe, that he had paid his retirement savings out TWICE to cover taxes. This is a Big Business vs. Small Business problem. And I doubt Barack Obama has any handle on that at all. I suspect we will see many more small business failures... and folks will take their own lives or worse over them. Last line says Construction workers as well. Again... I believe we will see it's a small business problem. We are taxing them to death and making it impossible for them to compete. It is interesting that you say this is a big business versus small business problem because I have said for a long time now that Barack Obama has the support of both community activists and wall street, and that is a contradiction of epic proportions. The three links in the article show Barack Obama first saying he was going to do "something" about home foreclosures over a year ago and the second link shows him waffling a couple of months later. Now its ten months later and we are seeing the signs of civil unrest brought on by a president too consumed about doing something grandiose about health care and global warming when smaller measures in the home foreclosure market could make a huge impact immediately. If people continue losing their homes at a rate of 10,000 homes per day the promise of healthcare for all in the future becomes more and more irrelevant to what is going on today. HILLARY CLINTON IS NOT A PROGRESSIVE. PUMAS wish Bill Clinton Well. Vegan Dog Food from the HSUS.